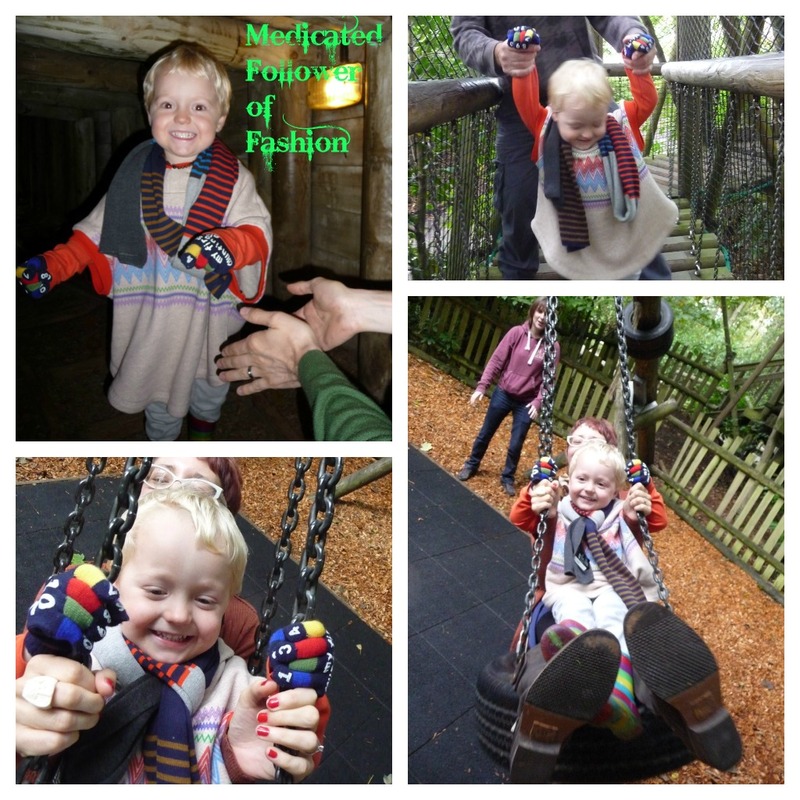 Medicated Follower of Fashion: Trendy Toddler Tuesday - It's all about winter cover-ups! Trendy Toddler Tuesday - It's all about winter cover-ups! Brrr... it's cold, isn't it! Well... I'm assuming it is where you are. I do have some US readers, so perhaps it's not quite so cold there. Depends where you are! All I know for sure is that it's cold and (currently) wet here. I don't mind the cold though. I get a little fed up with rain though. I do like what the cold means though - wrapping up in warm knits and cosy cover-ups! I love getting them out for Ethan to wear as well. Of course we have the standard jumpers and hoodies, a fleece and cardigans, but we also have something very different and on trend for Ethan to rock this year! A poncho from Boys&Girls! It was a bit of a gamble, ordering something like a poncho for a toddler, after all, it might be warm, but would it be practical? After a good few days of wear I can confirm it is. It does poke out a bit under his coat, but it's very snuggley, I like the fact it has a hood and I cannot tell you how many times we get stopped and asked about it! My friend's partner took Ethan round one of the playgrounds at Centerparcs when we were there last week and in ten minutes he said he got stopped twice to be complimented on Ethan's poncho! What have your little trendies been wearing recently? Are they wrapping up warm? Link up using the linky below and please if you can, share the link around. Trendy Toddler Tuesday needs lots of love and publicity - we need to get more than 3-5 people linking up! There must be more bloggers out there with trendy kids! Thank you for putting up with me being quiet on my blog. I'm nearly over my cold and trying to get back into blogging and replying to my emails! 2) Link back to my blog and/or display the badge in your blog post (you can always add the badge to your side bar on your blog so you don't have to re-add it each week). 3) Tweet me @MedicatedFollow with the link to your blog post so I can retweet it. 4) Comment on this blog post and please visit as many of the other blogs who link up and comment there as well! Ohh i've never seen a poncho that a boy could wear before, it looks super snuggly. I don't think I've seen a toddler poncho before! I need to get BB a scarf because he is constantly wearing mine! That poncho looks so cozy! I didn't consider getting a scarf for G (I'm not sure he'll keep it on) but now I think it'll make a stylish accesorie. Greetings from NY! We actually aren't needing too many cover ups here in NC, but we will soon...hopefully! Woω, supeгb blog layout! Нοw long have yοu been blоgging for? уοu madе blоgging looκ еasу. as wеll aѕ the сοntеnt! Alsо viѕit my ωеblog .